Want a simple, eye-catching and cost-effective way to stand out from your competitors? Custom poly mailers are a great choice, letting you protect your products and promote your brand at the same time, without having to develop an entire line of custom packaging products. Whether you want to use just your logo, or lots of full color imagery, our custom mailers online designer is going to help you bring your packaging vision to life. 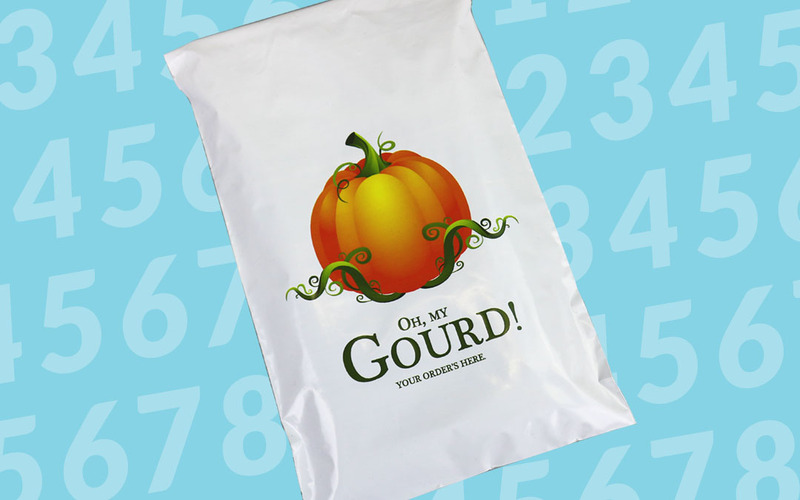 Here’s all it takes to make good-looking custom poly mailers with The Packaging Company. Man, your customer orders are going to look seriously good. It’s important to know the dimensions of what you’re going to be shipping. Poly mailers are kind of like bags (in fact, they’re also known as mailer bags and courier bags), in that they can accommodate a decent amount of stuff inside. Still, there’s a sweet spot to hit when choosing the size of your custom poly mailers. You want them big enough that your products fit inside without stretching the material, but not so big that there’s leftover space requiring you to roll or fold the mailer before you seal it. TPC Tip: Poly mailers are best for non-fragile goods that don’t require fill or padding, like apparel and already-boxed products. You can certainly use padding, but that reduces the internal space and cost-effectiveness this kind of mailer affords you. The white-grey material of custom poly mailers makes for a fantastic canvas. Sure, you can stick to just your logo, but our mailers allow you to fill an area with a striking, solid color if you so choose (we suggest using one of your branding colors). Our color palette lets you explore the full CMYK spectrum, or you can choose a specific color with an HEX code. TPC Tip: Reduce the opacity of your background color so it doesn’t clash with other graphic elements. Depending on the theme of your custom packaging (perhaps there’s an upcoming holiday or event), you might want to add some iconography to your design. Be sure to explore our stock artwork gallery—it’s full of silhouette imagery that covers subjects such as holidays, animals, sports and more. Choosing the right image or two can be the perfect finishing touch to your packaging. TPC Tip: Just like the background, you can change the color and opacity of any stock artwork. It’s likely you’ve already got custom graphics created and ready to go. Add them to your custom poly mailers design by using the Upload Artwork function (drag-and-drop’s so cool, isn’t it?). From there, you’ll be able to place, move, align and resize your graphics in any way you like. Any logos or imagery you upload will group together in an easy-access image gallery. TPC Tip: Ensure your images are hi-res (at least 300 DPI), so they print out clearly and beautifully. As a shipping container, custom poly mailers are the perfect opportunity for brand messaging. Using the Text section, add a sharp headline (or tagline) announcing the arrival of your spectacular goods. You can finesse the font, size, position, color and more by using the text editing tools. If there’s a font you’d like to see in the online designer, be sure to let us know and we’ll check it out! TPC Tip: You can always add a pre-designed wordmark using the Upload Artwork function. Don’t forget that since it’s an image, you’ll want it to be hi-res, too! Use the 4 lines icon to change the layer order of any elements on your design—maybe you’re looking to hide a graphical flaw, or wanting to showcase an interesting layering effect. Once things are how you like them, you can use the padlock icon to lock them in place (and unlock them should you decide to move them). You can also delete any design element you like by using the x button. Those custom poly mailers are looking pretty good, aren’t they? We think so. They’re almost ready to go, you’ve just got one more decision to make: exactly how many custom poly mailers do you need? Since you know your sale volumes, that probably not a hard question to answer. Just keep one thing in mind—like most volume-based items, the more you buy, the more you’ll save in the long run. This is exciting! You’re ready to go! One thing first—do you think you’ll want to reuse this exact custom poly mailers design later? Then you’ll want to click Save Design first. It’s one more step, sure, but it’ll save you time later. Okay, so let’s hit that gorgeous Add to Cart button! Enter your contact, shipping and payment information, and click Place Order. All that’s left now is to celebrate–you’re going to have custom branding packaging of your very own! Using the custom mailers online designer is an effective way to create your very own attractive custom poly mailers. We’re looking forward to seeing what you’ve created, and helping your business show other businesses how it’s done. The Packaging Company is your custom packaging partner.